Welcome to the newly refreshed Calder Security website! We’ve spent a lot of time streamlining the site and creating more defined areas relevant to our customers. While at first glance the design hasn’t changed much the main development is a split between services for homeowners and services for businesses. We felt that our customers wanted information that was easy to find and directly relevant to them. Creating these 2 distinct areas of the site should do just that. 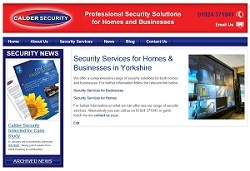 Many of our services are complimentary to each other so we’ve interlinked information more thoroughly to demonstrate the range of security services we offer, how they work together and how they can help you create extra levels of security for your home or your business. We’ve also added a blog area. Here you’ll find articles, advice and new developments on the hot topics in security. We aim to impart some of our knowledge and expertise in a way that people will find informative and useful. We’ll continue to keep you up to date on developments within the company through the News page. We’ve also made it even easier to connect with us, offering several ways that you can get in touch/keep up to date including our contact form, newsletter sign up and all our social media links for Facebook, Twitter and Linked In. We’d love to know what you think so please leave your comments here or contact us.